Here are the best Black Friday deals on the KitchenAid Stand Mixer. There are several models available to watch the prices. Again, I think we are going to see a price drop from Amazon.com and possibly Walmart.com once the day gets closer. *There is a $30 Mail in Rebate available when you buy the 5-qt. or 5.5-qt. mixers! KitchenAid Artisan Series 5-qt. Mixer, Empire Red – $237.49 (submit $30 rebate) $207.49 plus FREE shipping! *Walmart doesn’t have Black Friday pricing but this is the current online pricing. There is now a $30 Mail in Rebate from Amazon when you buy the 5 qt. 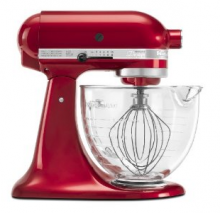 You can get this pretty red mixer for only $207 SHIPPED! It’s $260.50 today, was it less yesterday? I was going to order!